Zephyr 5/16'' hex insert shank B.N.A.E. (metric) screwdriver bits. For aircraft or machine screws. Also known as French recess bits, the name comes from the Bureau de Normalisation de l'Aeronautique et de l'Espace. The H7328AA Zephyr 5/16'' B.N.A.E. #8 Insert Bits is one of thousands of quality tooling products available from MRO Tools. Please browse Zephyr B.N.A.E. 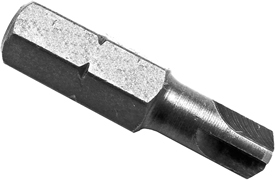 Screwdriver Bits for tools similar to the H7328AA Zephyr 5/16'' B.N.A.E. #8 Insert Bits. H7328AA Zephyr 5/16'' B.N.A.E. #8 Insert Bits description summary: Zephyr 5/16'' hex insert shank B.N.A.E. (metric) screwdriver bits. For aircraft or machine screws. Also known as French recess bits, the name comes from the Bureau de Normalisation de l'Aeronautique et de l'Espace. Point Size: #8 Overall Length: 1 1/4'' Quantity discounts may be available for the H7328AA Zephyr 5/16'' B.N.A.E. #8 Insert Bits. Please contact MRO Tools for details.